Curious about what Indiana's congressional districts have looked like over time? Want to know the Republican-Democrat breakdown for any given time frame? We've got color-coded Congressional maps back to 1816 right here. 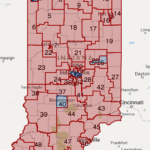 Here's a look at the current maps for Indiana State Representatives. 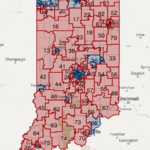 Here's a look at the current maps for Indiana State Senators.